Carnival has arrived! For many of us, costume planning is an enthralling project that lasts the entire season, and sometimes even the entire year. Miss Claudia’s Vintage Clothing and Costumes is a beacon in the costuming cosmos and offers a medley of vintage and contemporary items for all of your dress-up endeavors. Locally owned businesses infuse New Orleans neighborhoods with their unique character, and are a big part of why we want to live, work, eat and shop here. The Shopkeeper Stories series shares the vision and personality of New Orleans business owners. What ignited the spark in you to start your business? I wanted to work for myself and have always loved vintage clothing. I come from an acting background and found my niche in portraying historical characters including Madame Begue, Baroness Pontalba, and Margaret Haughery, to name a few. I’ve always felt it was important to maintain the traditional clothing of these historic figures. Almost all of the vintage clothing and accessories in my shop come from New Orleans. The pieces are beautiful, exceptionally well-made, and historic. Many pieces are several generations old and have their own personality. 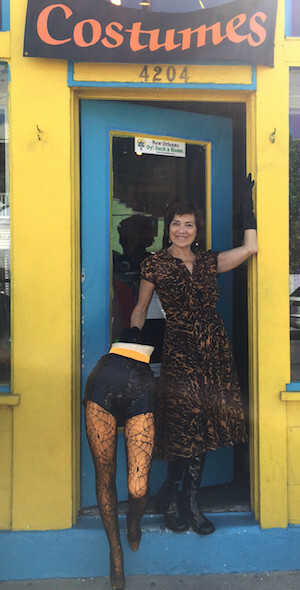 Clothing is an important piece of New Orleans and its history, and I’m happy to preserve it. What makes New Orleans businesses so special? There are several things that bind all New Orleanians together: the love of our city, its food, distinctive architecture, Mardi Gras, porch culture, and so on. Each neighborhood creates its own essence, culture, and expression. We are distinct and at the same time unified, and we never miss an opportunity to celebrate that. Our customers run the gamut: hipsters, uptown folks, drag queens, college students, and vintage seekers. We have a large selection for men, which is great because they are quick shoppers! The amusement of costuming is universal. We get dressed up for holidays, parades, Mardi Gras balls, and festivals, and what each person dons is an expression of him or herself. Big Freedia has been a frequent customer as well as many national celebrities. If your shop was a cocktail, what would it be? Pimm’s Cup, especially if it’s from the Napoleon House. Clothing is a way for people to express themselves. Some people are flamboyant, some are less extroverted, and others want to make a statement every time they get dressed. I understand clothes and I believe they make people happy. Clothing is not necessarily a priority for everyone, but there is always an occasion where someone wants to feel good about their outfit. Miss Claudia’s Vintage Clothing & Costumes specializes in finding eccentric items and matching them to the right person. We are happy to lend our fashion suggestions to everyone. What’s your favorite local biz in your area? Fun Rockin’ further down Magazine specializes in costume accessories and fun gifts. Plus, the owner there is very supportive of other local businesses. Will you share your secret lunch or dinner spot? There are so many great places I frequent; Café Degas near my home in Mid-City and La Petite Grocery are just a couple. What advice would you give a budding business owner? It’s a balance between trusting your intuition and not falling into the trap of wishful thinking. A lot of businesses are started on a whim, and that’s completely okay. However, don’t pretend that something is working when it’s not. You can have an idea that is really great, but in the end it doesn’t work. That doesn’t mean you shouldn’t try it, it just means don’t put all of your resources into it. What is your favorite event to dress up for? My favorite is Carnival! It’s celebrated for an entire season and it’s purely unacceptable to wear the same costume twice. It’s the quintessential opportunity for creativity. New Orleans is full of creative people with great ideas and I love to help them bring their costume together. While drainage system improvements and road construction make “shopping local” a bit more challenging in the short term, the critical improvements mean our city will be safer and stronger for generations to come. We hope you are inspired and continue to shop small and shop local—even if it takes a little extra time! The Shopkeeper Stories are brought to you by StayLocal, the Greater New Orleans independent business alliance, in partnership with Uptown Messenger. Learn about their work or become a member at www.staylocal.org or email info@staylocal.org. While for someone like me, clothes are merely a way to avoid being arrested.